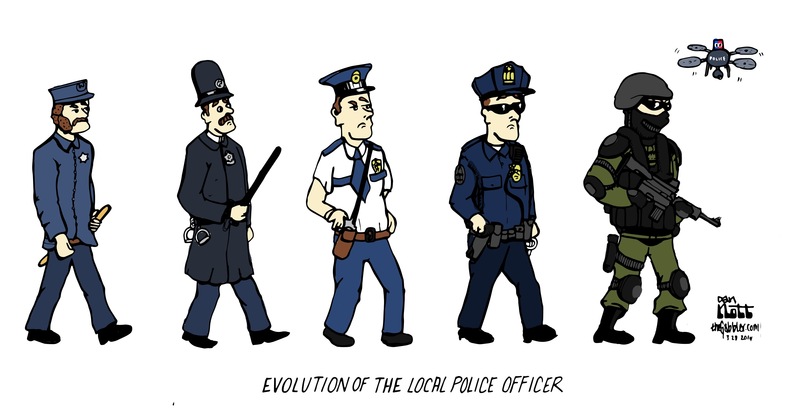 Over the past three decades, local police forces have seen a tremendous influx of military weaponry and technology. Investigative reporter Radley Balko writes that starting in 1997, the “1033 Program” has allowed hundreds of millions of dollars worth of military-grade weaponry to be transferred to local civic police stations. This inventory includes tanks, grenade launchers, and .50 caliber machine guns that are largely impractical for police work. The tactics have also become militarized. Criminologist Peter Kraska estimates that annual deployments of SWAT and paramilitary police have surged from 3,000 in 1980 to around 45,000 in present times. This increase appears to be a result of mission creep — while originally conceived to be used in the most extreme scenarios such as hostage situations and bank robberies, Kraska points out that the majority of SWAT raids are now centered on drug-related crimes, with authorities often breaking down doors during pre-dawn hours to serve warrants. While these forces have an important role in dealing with the most volatile situations, the huge surge in the use of SWAT teams and military-grade weapons for regular police work should raise concerns about the impact of militarization on the relationship between law enforcement and civilians.